1. Sift the flours and baking powder into a large bowl. Add the sugar and stir to combine. Make a well in the centre, and add the eggs, milk and butter. Beat with a wooden spoon, gradually incorporating the flour, until you have a thick, smooth batter. If the mixture is too thick, add a little water to loosen. 2. Heat a large non-stick frying pan over a medium heat and brush with butter. Cook the scones in batches. Drop tablespoons of mixture into the pan, leaving space between spoonfuls to allow for spreading. Cook for about 2 minutes, or until bubbles appear on the surface, then turn the scones over and cook for another minute. Repeat with the remaining batter. 3. 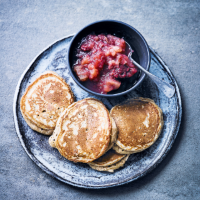 Serve immediately with warmed apple and berry fruit compote and a drizzle of maple syrup, if liked.